it's schmaltz day. a day for reminiscence of the sappiest kind. 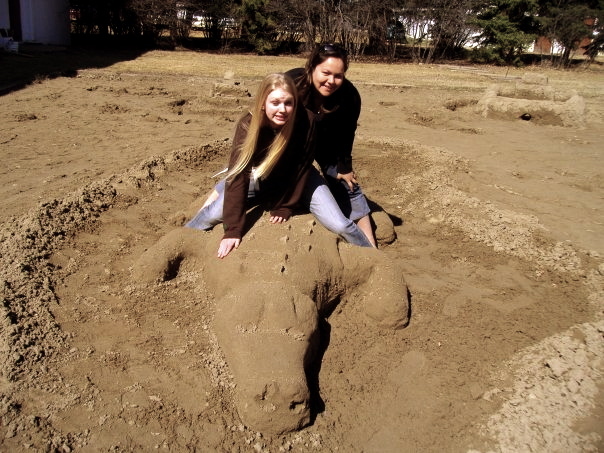 this is my friend, lish, and i riding a sand alligator. you'll notice that my face is the perfect picture of consternation. this picture was taken right smack dab in the middle of a pretty crappy weekend. i don't remember all of the details, but alligator riding was definitely the high point of it all. schmaltzy, i know. here is a fitting song for today because of it being named "alligator". i invited tegan and sara to my birthday party along with imogen heap. i hope someone shows up or i'll just feel like a big lonely poop.